Homemade Warm Chocolate Cakes are perfect for any special occasion. I'm here to share a secret with you: The most sophisticated of chocolate desserts is unbelievably simple to prepare! At many fine dining establishments, you may see warm chocolate cake on the menu, described with elegant adjectives like "decadent," "sumptuous," "rich," "lava," "soufflé " or "molten". Ask for more details and you'll probably hear about the fancy chocolate that they use (Valrhona, Callebaut or Scharffen-Berger) or about the luscious melted center. What restaurants won't tell you is how easy this dessert is to make! A wonderful book by David Lebovitz! This dessert always impresses guests, and no one ever guesses how little effort it took. You can complete the entire prep and baking process in 40 minutes! You won't be disappointed, and your beau will be delighted! I recommend David Lebovitz' recipe, which is designed to prepare several individual cakes. The most important advice for preparing this dessert: Use high-quality dark chocolate, at least 62% cocoa up to 70% cocoa. I've tried the recipe with single-origin artisan chocolate from Dandelion Chocolate, and the results were excellent. The recipe also works well with Scharffen Berger Semisweet Chocolate (62% cocoa). 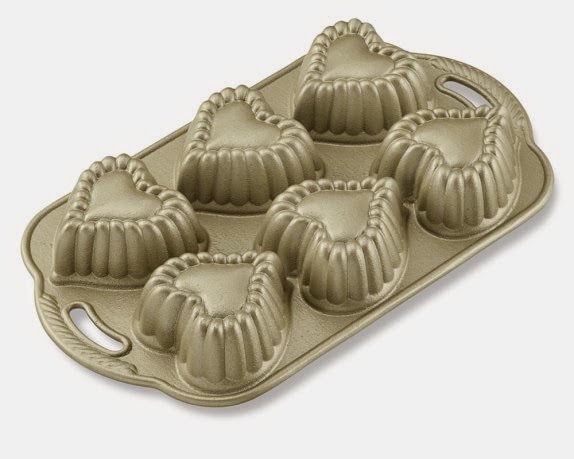 You may use any type of baking tin (even cupcake molds), but I love the Williams-Sonoma Cakelet Tin. These individual heart-shaped cakelets are so cute! An absolutely irresistible dessert, melty chocolate cakes are wonderfully rich yet light and fluffy. The texture is almost like a soufflé because the cakes are flour-less (so they're gluten free as well!) The recipe prepares six to eight individual cakes. Before you begin, preheat the oven to 400 degrees Fahrenheit. 1.) Break chocolate into pieces and place in a bowl over a pot of boiling water. Combine with the butter and allow both ingredients to melt, then stir gently. Once melted and mixed together, remove from the heat. 2.) In another bowl, whip the egg whites. As soon as they get frothy, add the sugar and continue whipping until they are shiny and very fluffy. 3.) Stir the egg yolks into the chocolate-butter mixture. 4.) Fold one-third of the egg whites into the chocolate-butter-egg yolk mixture, and stir gently. Then fold the remaining egg whites into the mixture. 5.) Spoon the batter into your cake molds (buttered and floured) and bake for 12 minutes. They should be slightly unbaked in the center so that the texture is like melted chocolate rather than a cake. After removing from the oven, allow the cakes to stand for a few minutes before releasing them from the molds. 6.) Serve the cakes while still very warm! Add a touch of garnish such as powdered sugar, raspberries and mint leaves. Wow these look simply amazing! I can't wait to make these and treat myself. Flour-less chocolate is always my weakness and these look to good to resist. Plus they are gluten free!! Hey, can I just use cupcake liners in a cupcake tin instead of buttering/flouring the cupcake tins? Thanks in advance!